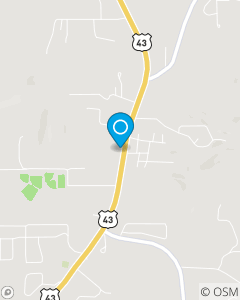 We are 0.6 miles south of Wal-Mart. Across from The Smoke Shoppe and Jackson Home Health on Hwy 43. Our vision is to honor God in every area of our business and to strive for excellence in meeting the needs of our customers. With the utmost honesty and integrity, we will continue to build our brand and reputation in the community, develop and strengthen relationships, and be good stewards of our time, talents, and resources.